While maneuvering I find it useful to have SAS point in a particular direction, e.g. pro-target. Using ijkl (or wasd in docking mode) one can then fine tune the prograde vector with thrusters. However, even if I have a strong electrical stability system, SAS still feels the need to use thrusters as well. This messes up all fine control as it jumbles around the prograde. Some components such as torque wheels allow the wheel control to be switched from 'normal' to 'pilot only' to 'SAS only'. 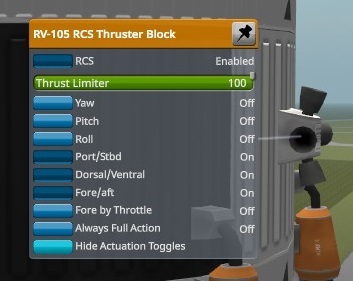 However, both monoprop thrusters as well as the Vernor thruster apparently only allow to toggle RCS in an all-or-nothing fashion. 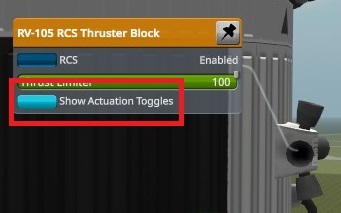 You can't set an RCS thruster block to "Pilot Only", but you can prevent it from handling rotation at all while still handling translation. Reaction wheels are usually far more convenient for handling rotation than RCS thrusters anyway, because they won't affect your velocity or burn precious monopropellant. So you often want the RCS thrusters to handle translation only and leave rotation control to the reaction wheels. You can do that while building a vehicle in the VAB/SPH or when the vehicle is in flight. 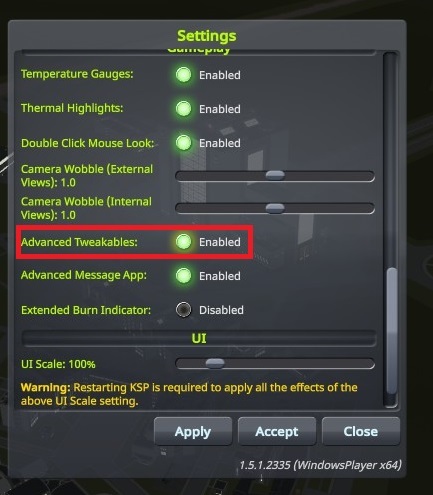 How can I kill Kerbals? From what drop height can they not survive? How can I get science from my space station to cash in the points? How can I calculate the right number/types of parachutes for my craft? How can I prevent a part from being added to any stage? How do I keep my rockets from blowing up the pad without launch stabilizers? How to tell scientist from pilot from engineer? When using Deadly Re-entry, how can I add heat shielding to unshielded parts? How can I get a pod back from orbit when it's out of fuel? How can I find the way back to the runway?